It took me three years and a sum of money I try not to think too much about, using bravery gleaned from hundreds of hours of research, reading and re-reading Cosplay.com threads, DeviantArt tutorials, and the sewing skills I’d gained from my surgery clerkship (yes, I used subcuticular stitches for much of the hidden hand stitching, and a curved needle with suturing tools to sew the top skirt on! ), but the results were oh-so-worth it. And so it was that I found myself standing in the fabric section of JoAnn’s in the spring of my fourth year of medical school, looking at that same tissue paper lamé and realizing that it was too gaudy and cheap and thin to ever work. I’d spent months and months working up the courage to go all-out by reading this Cosplay.com thread; I was by no means a teenager anymore, and months away from becoming a professional (and my philosophy became something akin to “if I’m going to go out in public looking ridiculous, I’m going to look damn good while doing so.”) A trip to LA’s fabric district was totally out of the question as my husband hates downtown LA… but then he surprised me by finding this discount fabric place in Anaheim (M&L fabrics) that we could go to instead. Based on tutorials I found online, I made 2x tiered circle skirts (with the blue skirt being the longest). Then I put 1″ horsehair braid in the hems to fluff out the skirt to give it that ridiculous body that all Seramyu skirts should have. I won’t lie — cried, swore, and tore my hair out a lot while doing this. My machine messed up many a time because of the thickness of the layers of spandex and the horsehair braid and I had to unpick so many seams, too. I have since learned that if your horsehair braid doesn’t come with the loops that you can pull up to curve it… you’re supposed to sew in a stitch that you can pull to gather it in the shape of the hem. You can see where there’s puckering in the spandex because I didn’t know that; my hems look awful. My subsequent experiences with horsehair braid have been much less violent. Also, in retrospect — I should have made the inner circumference longer to allow for more pleating, and I would not have made the skirts tiered but all the same length because of all the extra circumference it meant. The pink puffed sleeves were somehow drafted using this tutorial, mocked up in some cotton I had lying around, and then made in the beautiful metallic pink spandex. The bottom is ruffled and attached to another ruffle attached to a casing in which there is elastic. The sleeve was unfortunately not quite stretchy enough, though. Then I started on the collars, after drafting many a pattern that I wasn’t happy with. I used Lynleigh’s pattern initially and tried to modify it to work, but I was either inept with following the pattern or it just didn’t look right. This version was way way way way too curved. I don’t know what I was thinking. Seramyu shoulders stand up and are pretty darn stiff, so the shoulders were made by cutting out a layer of the thickest interfacing I could find at JoAnn’s (really, it’s pretty much cardboard) and fusing that to a layer of blue spandex to which the blue metallic confetti dot had been sewn, sewing another layer of blue spandex on the other side, and then flipping the pocket around neatly. The collars stood up waaaaaaayyyy too much, but… oh well. Also, by this time I realized that the V-neck that I’d cut into the leotard was wayyyyyy too shallow, but I was too scared (and crunched for time) to change it. Next up was a huge wing/bow shape — drafted by hand initially on scrap fabric, then transferred to interfaced prismatic spandex and gathered. I made glove rolls by taking sandwiches of fabric, turning inside out, then sewing the three channels in place and stuffing. I did the gold wings on the gloves with heavy interfacing fused to gold spandex and cut out. It looked wonky, awful, but… at least it was done. At this point, all the fabric things were essentially done. I also spent a lot of time feeling frustrated at my lack of ability with clay. I failed really hard at making things symmetric… I was so frustrated, I actually ended up cutting my earrings and choker out of interfacing and gold spandex. AHHHHHHH SO FLUFFFYYYYYY <3 <3 <3 You can’t see the holographic spandex part on the front very easily, but it’s there. I think making the wings was easily one of my favorite parts of making this costume. During this whole time, there had also been several months of alchemy during which our kitchen was entirely out of commission. We didn’t cook (not that we did much before, but…) Following tons of research and watching YouTube videos of people make Sailormoon wigs, I purchased an Arda Chibi with a long ponytail clip in Platinum Blonde — at this point, they didn’t have the crazy bright yellow that was key to the Seramyu look, so I researched dyeing methods and eventually settled on trying to do the Rit Dye method. I used bottles and bottles and bottles of dye, to no avail; it ended up more of a buttery yellow than the bright yellow I’d hoped for. Then there was straightening it all out again as it had turned into a royal tangled mess. I was about to scour the town for Sharpies, but never ended up having the time. I used this tutorial for guidance in making my wig, 2am the morning before the con I was going to… even despite the stress and craziness, I learned that I enjoyed working with wigs, and these days it’s really, truly easier than ever! Having the Arda Chibi was really lovely and cut out so much time/effort/stress; in high school and beyond I read of crazy sorcery that was required to make an odango-styled wig — things like extra wefts passed under the wig cap and heat sealed, a cap sewn in underneath to make it more tolerable to wear, hot water curling because back in those days wigs/fiber weren’t heat resistant. I honestly doubt that I’d have been brave enough to try that right off the bat without any experience with wigs before. I didn’t finish in time everything in time before the con, though. I collapsed into bed instead. But throughout the rest of my summer before starting residency, somehow, I put together something that looked somewhat like what I’d dreamed of all those years ago. The trim was sewn on in the mornings after night float, and a couple of times I brought the ridiculous box with me to work and on quieter nights with few kiddos that needed to be admitted, I was able to just sew away on it bit by bit, because it was a lot of trim! Three rows each, and that blue skirt which is so much longer around the hem than any others was particularly time consuming. Then time for all the other accessories that had been missing! The feather hairpins were wired to a clear headband — still not clear enough though, it’s actually a very light green. I also remade the compact — a heart gem purchased off Etsy, laid on a bunch of beads I made from super lightweight Sculpey, painted in pearl acrylics, and then threaded on wires which crisscrossed in the back to make a “bed” for the gem. Then I cut out a clay heart shape slightly bigger than the heart gem, baked it all, hot glued the gem and pearl beads threaded onto string onto it, and plopped it in the middle of the wire cage. Photo credit: Top two photos by JediDarkKnight@Flickr; bottom right was taken by my husband, bottom left is a photo I’d been sent with no source. My very first con, Anime Expo 2013. <3 I was missing the moon on the belt, my collar still drove me nuts, the chest wings/bow was still not heavily interfaced enough, and my earrings and jewelry were all interfaced gold spandex… but there was such an amazing sense of accomplishment being mobbed at AX for photos! To be able to stand there wearing something that I’d somehow crafted with the behemoth of the Internet behind me — I think this is proof of how amazing putting technology out there in the hands of people who use it to communicate what they’ve learned with others is huge (and really, the whole reason I’m writing this long long long post)! The edges of the skirt being visible really bothered me. I re-gathered and re-pinned this about fifty billion times, cursing how I hadn’t allowed enough additional circumference around the waist for pleats fifty thousand times (at least). I remade the belts much more cleanly this time, and made clay the moon on the belt, which was then sprayed with gold spray paint and decorated with acrylic gems. I also remade the collar. Again. And then took it out for a photoshoot with my amazing friend Renato Daluyen! At this point, I hadn’t yet velcro-ed the belt to the skirt, or curled the tails of the wig using a PVC pipe and a heat gun. I added a short bang clip from Arda as well to add more fullness to the bangs. Sailormoon stands up for and selflessly gives of herself to help others, despite the cost. She holds onto hope even when things seem bleak. She believes that everyone has kindness within. She trusts in the power of her love to dispel anger and hatred, choosing instead to purify and heal. I started crafting this costume in my final year of medical school because of my love for Sailormoon. But beyond cosplay – with patients and families, no matter how difficult, she reminds me to seek the kindness in others, to never lose hope, and to keep fighting for those who cannot. The wings need to be braced better, so they aren’t constantly folding backwards. The top layer of trim is still not fully tacked down in all the places it needs to be… more night float sewing goodness, perhaps! Better sleeves — these ones get flat sometimes! They need to be interfaced too; I probably will be extolling the virtues of interfacing to my grave as I use it for almost anything and everything in order to make things do what I want them to! Improve that stupid V-neck in the front — I still think it’s too high, and when I pose/move about it shifts too high. Get brave enough to trim the leotard with gold trim the way it’s supposed to be! 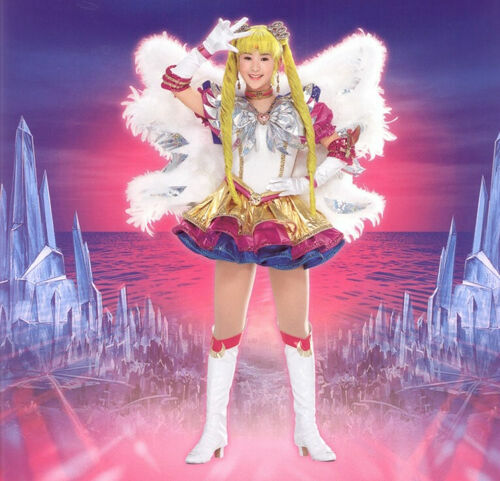 This entry was posted in cosplay and tagged cosplay, eternal sailormoon, sailormoon, seramyu, tutorial. Your costume looks amazing!! Your research and attention to detail definitely paid off, because it’s extremely accurate! I wanted to let you know, I’m pretty sure the metallic trim you used is the exact trim that was used on the real costumes. (I thought I read that they had stopped making it, but I guess they didn’t?) “Pineapple pleat lamé” is something totally different and is what people used to use because there was no way to get the “real stuff”. It’s very cheap- and inaccurate-looking, so you did good :-) I also think using metallic spandex for the skirts was a very good choice – tricot lamé is delicate and the foil rubs off, leaving plain silver patches that would ruin it. I think you did a fantastic job! Janessa, thank you so much for your sweet words! I’m so so happy to hear you say that — it did look similar but I’ve never seen pineapple pleat lamé up close so when the word was handed down from on high that that was the trim to get I thought that was it. Also glad to hear that metallic spandex was the better choice… yeah, it was papery thin and I didn’t like that… and I’ve been to AX in this costume for 3 years now so it’s been pretty worn! Sometime, when I make version 2.0 I think I’ll try making the leotard portion out of a non-stretchy fabric so I can put the trim on the leotard to make it even more SUPER accurate hahaha.